We welcome district or customized training opportunities. Why Become an ISTE Certified Educator? Recognized by ISTE, valued by leaders. The ISTE Standards define a new skill set that empowers educators to rethink and redesign learning with technology. ISTE recognizes individuals who can demonstrate and apply the standards, earning the distinction of an ISTE Certified Educator. Leaders are looking for those with a growth mindset to adapt, thrive and lead learning with technology in their schools and districts. Earning the ISTE Certification demonstrates to leaders and colleagues those who have the initiative, drive and skills needed to transform, personalize and empower learning in the classroom and school. Based on globally recognized standards. States, districts and schools are using the ISTE Standards as their framework for digital learning because the standards are based on research, were built by educators for educators and help prepare students for success in a digital world. Educator preparation programs are using the ISTE Standards to graduate the next generation of teachers capable of using technology purposefully for learning. 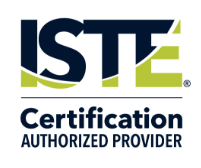 Unlike certifications from the private sector, the ISTE Certification for Educators is vendor neutral, so the skills developed will be transferable to any system, device, or tool. While technology opens up a whole new world of opportunities for learning, the ISTE Certification for Educators focuses on changing practice and improving learning outcomes with technology.